Is the Welterweight Division the Strongest in Boxing? The welterweight division is packed with talented boxers and mentioned as the toughest division in boxing. The WBA Super World and WBC champion is Keith “One Time” Thurman, 28-0 (22), of Clearwater, FL, who defeated Shawn “Showtime” Porter, 28-2-1 (17), of Las Vegas, NV, in June of 2016. Thurman is scheduled to defend his title May 19th at the Barclay Center, in Brooklyn, NY, with an opponent to be named. Thurman hasn’t fought since March of 2017. Porter won the WBC Silver title in November 2017. He also lost to Kell Brook, of the UK. He entered the ring over the weekend barking at Garcia who had just defeated Brandon Rios. He had to be escorted out of the ring. Devon Alexander “The Great”, 27-4-1 (14), of St. Louis lost his IBF title to Porter in December of 2013. He drew with the former WBC champion Victor Ortiz, 32-6-3 (25), of Ventura, CA, this past weekend and was robbed. Porter lost it to Kell Brook, of the UK, in August of 2014. Brook lost it to Errol Spence, Jr. in May of 2017 and hasn’t fought since and dropped out of the ratings. 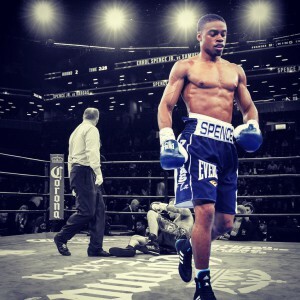 Spence still holds the title and is 23-0 (20), of DeSoto, TX, and in his once defense he stopped Lamont Peterson, 35-4-1, in January of 2018 who is no longer in the ratings. Spence is scheduled to defend his title on June 16th in Dallas, TX, with an opponent to be announced. Lucas “La Maquina,” Matthysse, 39-4 (36), of Argentina won the WBA World title stopping Tewa Kiram, 38-1, of Thailand, in January of 2018, and Kiram is no longer in the ratings. Matthysse lost to Danny “Swift” Garica in 2013 at Super Lightweight. Garcia, 34-1 (17), of Philadelphia, PA, lost his WBC title to Thurman in March of 2017. He just had his first fight since then stopping the former WBA Lightweight champion Brandon Rios, 34-4-1, this past weekend. Garcia was asked afterwards if he wanted a rematch with Thurman and he said “that’s up to him.” Garcia is No. 2 in the WBC and No. 1 in the WBA. The WBO champion is Australia’s Jeff “The Hornet” Horn, 18-0-1 (12), who won the title on a gift decision over former world champion Manny “Pac Man” Pacquiao, 59-7-2 (38), of the Philippines in July of 2017. Horn must fight his No. 1 contender Terence “Bud” Crawford, 32-0 (23), of Omaha, NEB, who held the four organization title at Super Lightweight and is having his first welterweight fight. That is scheduled for April 14th in Las Vegas. Pacquiao is ranked No. 3 by the WBC and No. 2 by both the WBA and WBO. He is scheduled to fight Mike Alvarado, 38-4 (26), of Thornton, CO, April 14th in Las Vegas. The IBF’s No. 1 and No. 2 slots are vacant. Cuban Yordenis Ugas, 21-3 (10), of Miami, FL, who is No. 14 and stopped No. 11 “The New” Ray Robinson, 24-3, of Philadelphia, PA, over the weekend with the winner promised the No. 2 spot. The No. 3 spot in the IBF is held by Carlos “Chema” Ocampo, 22-0 (13), of Baja CA, Mexico, who has never fought outside of Mexico. He has not defeated anyone of record but still has that high rating. Either Ugas or Ocampo may get that title shot at Spence. Jesse “The Pride of Las Vegas” Vargas, 28-2 (10), of Las Vegas, NV, is No. 3 in the WBA and No. 4 in both the WBC and IBF. He lost to Pacquiao in November of 2016. Vargas outgrew his WBA Super Lightweight title after his November 2014 defense and has gone 2-2 since. The UK’s British champion Bradley Skeete, 27-1 (12), is the WBO No. 3 and IBF No. 5 contender. He hasn’t fought since July of 2017. Another unbeaten contender is Russia’s Konstantin Ponomarev, 32-0 (13), living in Big Bear, CA, ranked No. 9 in the IBF and No. 8 in the WBC. So, to summarize the situation in the welterweight division both WBC and WBA champion Thurman and IBF champion Spence, Jr. have defenses scheduled without opponents at this time. Horn will be meeting Crawford who is heavily favored to take that title. Thurman may be fighting his No. 1 contender Porter. Spence could fight Ugas, Ocampo or Vargas. The division is wide open for some great fights!